In the late 19th and early 20th centuries states, counties, cities, towns and villages all across America erected thousands of commemorative statues, monuments, tablets and other memorials to honor their citizens who served in the American Civil War of 1861-1865. Additionally monuments that are national in scope such as those like Antietam and Gettysburg and in the nation’s capital city were constructed. 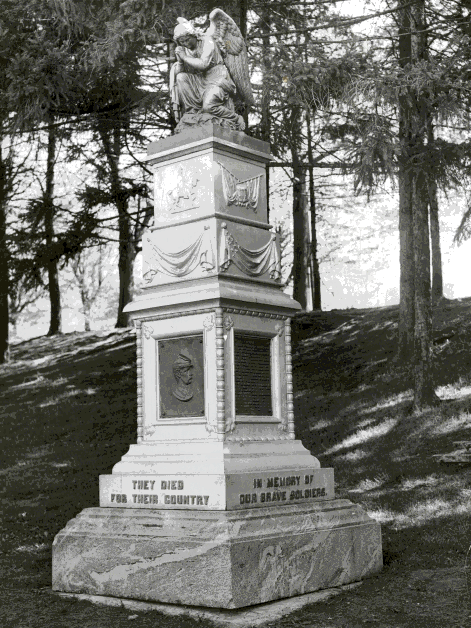 There is even a memorial monument in Edinburgh, Scotland dedicated to the Scots who fought in the Union Army. It is exceptional as it is the only American Civil War memorial outside of the United States. In almost every instance, there was an outpouring of community support and funds needed for these monuments were privately raised by subscriptions from local individuals and civic organizations of various kinds. However, monuments in state capitals and Washington DC were primarily funded by these governments since many of the governors, legislators and appointed officials from Northern and Southern States had served in the war and were members of various veterans’ organizations. A notable aspect of the Civil War monument phenomena was the unveiling ceremony attended by large crowds and which often featured lengthy dedicatory speeches, prayers, poems, parades, concerts, cannon salutes, dinners, dances, fireworks, and other festivities. The most popular designs for these monuments were the obelisk and the statue of either of a specific figure, usually a well-known general or the anonymous soldier in the “parade rest” pose. By far, it is the dominant design theme for Civil War monuments in Westchester County. The second choice in figures is the standard-bearer or color-bearer, holding a flag. He usually wears a short jacket often known as a sack coat, wraps his left arm around the flag, and has his right hand at the hilt of his sword, ready to draw in defense of his colors. A speaker at the 1903 dedication of a statute of General William Tecumseh Sherman in Washington DC, General David B. Henderson, claimed that: “the statues of the world are quiet historians.&#8221 They may be quiet but military statutes, war monuments and related memorials are nevertheless eloquent three-dimensional interpreters of a nation’s conflicts. The fact is that our view of the past does not come primarily from history books but from a much more complicated and interwoven set of sources that include mass media, regional and family folklore and the public spaces that contain heroic statues, name-filled plaques and other objects that recall and exalt long ago wars and other calamitous events. In the years following the Civil War, Americans in the North and South embarked the daunting task of commemorating and interpreting the story of 625,000 dead soldiers and their battles in stone and metal. As Walt Whitman wrote in, Specimen Days in America, it was “the dead, the dead, the dead — our dead — or South or North, ours all” that commanded the creation of monuments all across the country. American historian Michael Kammens states in his book, Mystic Chords of Memory (1991) that “societies in fact reconstruct their pasts rather than faithfully record them, and that they do so with the needs of contemporary culture clearly in mind – manipulating the past in order to mold the present.” Furthermore, it seems that Civil War monuments particularly in the South still have the power to color our view of that conflict 150 years after it was fought. 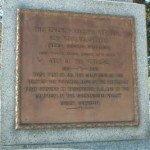 This post (and it’s forthcoming second installment) however, focuses on the Civil War Monuments found in Westchester County, NY where several private, civic, and veteran’s organizations erected statutes and other large memorials to the service and sacrifice of their sons and to proclaim the righteousness of the Union cause. Westchester County has 14 monuments, one each in Hastings, Mount Vernon, Montrose, New Rochelle, Rye, Port Chester, Sleepy Hollow, Somers, White Plains and Yonkers. Ossining and Peekskill have two each. 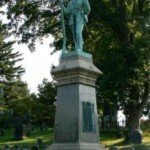 By far, the single-most design theme for Civil War monuments in Westchester County is the &#8220standing soldier” followed by the obelisk &#8211 one in Somers and one in Hastings. The latter interestingly enough, is dedicated to the Confederate dead. There are other non-soldier and non-obelisk memorials such as the “Kneeling Angel” in Ossining, a Civil War cannon in Katonah and others. This will be no means an inclusive list of all the county’s publicly displayed Civil War commemorative objects as the article does not discuss the various historical roadside markers and wall plaques inside museums, churches and other buildings and, tombstones of Civil War veterans buried at various cemeteries in the County. Infantry: 5th, 7th Veteran, 9th, 17th, 27th, 32d, 38th, 48th, 49th, 59th, 65th, 95th, 164th, 168th, 176th, 186th, 191st, 192d. Cavalry: 2d, 4th, 11th, 16th, 25th, 1st Mounted Rifles. Artillery: 4th, 5th, 6th, 13th,- independent batteries, 5th, 7th, 12th. Around 1870 a group of women from the then Village of Sing Sing (now Ossining) formed the “Ladies Monument Association” to erect a monument to the memory of the men of the Village who had fallen in the battles of the Civil War. They raised about $350 but this was simply not enough for the statue they had in mind. However, they did get enough for a cornerstone and it was ceremoniously laid on July 4, 1872. In accordance with the custom of those times, various dignitaries delivered long and florid speeches. A Civil War veteran, Colonel Benjamin A. Willis, of the Twelfth Regiment, New York State Volunteers, made one of these. Later that year, the “Monumental Dramatic Association” raised more funds by putting on plays at the Olive Opera House situated on the corner of Central Avenue and Brandreth Street. Their first presentation, “The Scout of Tennessee” was a hit. Soon after though a fire destroyed the scenery and other props and forced them to halt production. Nonetheless, by1879 they had accumulated $1550 for the monument and it was dedicated with great ceremony on Decoration Day (now called Memorial Day) of that year. The ceremonies included a huge parade consisting of hundreds of Civil War veterans who banded together under the name of the Grand Army of the Republic, several local militia companies, the Sing Sing Police and Fire Departments and the cadets of the Mt. Pleasant Military Academy. Local and state elected officials as well as the heads of various civic, religious and fraternal organizations made the obligatory orations. The Kneeling Angel Monument was originally sited at the junction of Church and Main Street, just to the west of the First Baptist Church where “Sasinoro Plaza” now is and it stood on a base of two massive granite blocks. The angel was cast from “white bronze.” Actually, it is not bronze but an alloy of varying amounts of copper, tin, and zinc. From the 1870s through the 1910s, “white bronze” was used as a raw material for grave markers and statuary. markers made of this material usually took on a pale gray or pale blue appearance, and stood up to the elements better than stone markers because they were less porous and they were substantially less expensive than real bronze, an alloy of brass and copper. Soon after it appeared, “The Kneeling Angel” acquired a derisive name, “The Squatting Angel.” Perhaps some felt that the figure’s kneeling position presented an image of sorrowfulness that was not in keeping with the martial and victorious spirit a winning side in a war ought to convey. In April 1884, the monument was moved from its prominent position in Downtown Ossining to the grounds of the old Park School to a spot where the present school playground is. Later in 1939, due to the construction of the new Park School it was moved once again to the lower part of Nelson Park and finally it came to rest at its present location at the eastern edge of Nelson Park. In January of 1887, a movement to have a new monument that would be more heroic in nature than the Kneeling Angel was launched. Accordingly, a prototypical image of a Civil War soldier with musket in hand was selected. It was similar to the soldier monuments found on courthouse lawns, battlefield sites, cemeteries and other public spaces in the North and the South. Thousands of these sculpted forms made of various stone and metal materials were produced. The man chosen to head up Sing Sing’s Monument Committee was Colonel Edwin McAlpin, a resident of the Village and commander of the 71st Infantry Regiment of the New York National Guard. (Col McAlpin did not serve in the Civil War) The committee included practically all of the Village’s prominent men and they contracted with Maurice J. Power owner of the National Fine Arts Foundry located at 218 E. 25th Street in Manhattan to cast it. Among the notable pieces of bronze sculpture produced by the foundry were large battle monuments at Trenton and Monmouth, New Jersey- Newburgh, Albany and Buffalo, New York- Augusta, Maine- Manchester, New Hampshire- Clinton, Holyoke, Lawrence and Springfield, Massachusetts- and others in Michigan, Ohio, Pennsylvania, Tennessee, Georgia and North Carolina. It is probable that the sculptor Ossining’s Standing soldier monument was Caspar Buberl (1834–1899) He and Power mutually worked on a number of other Civil War monuments and earlier in their careers, they apprenticed together. Ossining’s soldier was placed atop a 14’ granite shaft and he towers 7’ ft. 6” above that. A bronze tablet on the shaft bears the names of the 35 Ossining soldiers who perished in the War. According to newspaper accounts the dedication on Decoration Day, May 30, 1887 was preceded by a huge parade of civic and military organizations including McAlpin’s regiment who came on up from New York City on a train chartered by the Colonel at his personal expense. The total cost of the monument was $3,500. Originally, the statue was located over a small reservoir at Hubbell’s Corner (the intersection of North Highland Avenue (Rt.9) and Croton Avenues). Apparently, the statue’s location was a bottleneck and New York State and the Village agreed to widen the intersection and change the grading. Accordingly, in September of 1930, it was moved to the intersection of Pleasantville Road and Brookville Avenue where it stands today. Next time: more Civil War monuments in Westchester County. Photo: The Kneeling Angel Monument (Courtesy Westchester Historical Society). Here in Lakeview Cemetery on the shore of Lake Ontario in the Hamlet of Pultneyville, Town of Williamson in the County of Wayne, NY, we have what is believed to be the first and oldest Civil War monument in New York State and one of the very oldest such monuments anywhere in the United States. Hi Peter: I could be wrong but the Civil War Monument at Lakeville Cemetery may be the oldest one in New York State. Howeve.r it is believed that the honor of being the oldest Civil War monument in the United States goes to the “Bloedner Monument.” The 3,500-pound limestone memorial, was carved in the weeks following the 1861 Battle of Rowlett’s Station near Munfordville, Ky. I understand it was unveiled in 1862, The Battle of Rowlett’s Station was a one-hour skirmish on December 17, 1861 during which the 32nd Indiana Infantry, a regiment of German-Americans, warded off a Confederate attack. Union Pvt. August Bloedner used a natural outcrop of limestone to fashion the monument to honor 13 of his fellow soldiers killed in battle. Mr. Hernandez seems to have only counted white residents of Westchester County who served in the Civil War and the regiments in which they served. Black men from the towns and villages, especially from the African-American community, The Hills, also served. My own research focuses on thirty-seven black men from The Hills, the county’s largest African-American community with 191 residents in the 1860 census. This recognized community crossed the rugged town borders of Harrison, North Castle, and White Plains and dates its settlement from the 1790s. These thirty-seven men served in four regiments and the Navy. When New York’s anti-Lincoln governor Horatio Seymour refused to raise a black regiment, thirty-one black men from the Hills traveled out of state to enlist, i.e., to Massachusetts, Rhode Island, and Connecticut. One Hills man joined the Navy. Disappointed by Seymour’s hostility, the Union League of New York City organized the 20th Regiment, Infantry, USCT and five Hills men enlisted. However, my research does not account for all the Westchester County black men fighting for the Union. For example, three Peekskill men joined Hills soldier Jacob Williams in the 54th Massachusetts, the regiment celebrated in the movie Glory. In the fighting of October 27, 1864 before Richmond, Hills soldier John Lea Brown was killed, being the only man from Harrison to die in battle; he is buried with fallen comrades near the battlefield in Virginia. Twenty-ninth Connecticut Infantry Private Solomon Tierce of The Hills is buried in Sleepy Hollow Cemetery, near several other black soldiers from the county. Tierce’s name is included on the Civil War monument there, the statue described by Hernandez as “the anonymous soldier in the “parade rest” pose.” Several black soldiers from the county are buried with USCT markers in the White Plains Rural Cemetery, near the cannon bearing the tribute: “Honorably Discharged. U.S. Soldiers and Sailors. Erected by Cromwell Post 466. G.A.R.” Twenty-ninth Connecticut Infantry Private Thomas Lea Brown of The Hills, brother of John Lea Brown, is among those buried there. Thirteen Hills soldiers were buried with official USCT markers in Stony Hill Cemetery in Harrison. This Hills community’s burial ground is now listed on the state and national registries of historical sites. Other county black men who served in the Civil War are buried in the African-American Burial Ground adjacent to Rye’s Union Cemetery. Sadly, all these black men have been long neglected in the history of Westchester County. I seek to remedy that omission with my contracted book with SUNY-Press, slated for publication in September 2014: Freedom Journey: Black Civil War Soldiers and Their Hills Community, Westchester County, New York. Edythe Ann Quinn, Ph.D., is a Professor History at Hartwick College, Oneonta, NY. Quinn was Harrison’s municipal historian in the mid-1980s. Note: One Hills man served in the 54th Massachusetts Regiment; 14 Hills men enlisted in the 14th Rhode Island Heavy Artillery, aka 11th USCT, sixteen served in the 29th Connecticut Infantry Volunteers Colored; five men in the 20th United States Colored Infantry; and one man served in the Navy. Six men were appointed non-commissioned officers, two to the rank of sergeant; four to corporal; in battle, one man was killed, three were wounded and one was injured; and six men died of illness. Hello Professor Quinn. I am intrigued by the news of your forthcoming book and will read it when it is published next year. In any event, my article is about Civil War commemorative monuments and not about the racial or ethnic background of the tens of thousands of New York State soldiers who fought in that conflict. As you rightly noted the 47 black Westchesterites in your book fought in the various USCT units of other states including the renowned 54th Massachusetts. By far the best book about Civil War Monuments and the subject of race is by Kirk Savage and is called, “Standing Soldiers, Kneeling Slaves: Race, War, and Monuments in Nineteenth-Century America.” It tells the history of slavery and how it is depicted in public spaces–specifically in the sculptural monuments that are still abound in streets, parks, and town squares of 21st century America. Anyway in a future blog in this site I will be telling the story of Henry E. Duers an enslaved man from North Carolina who ran away from his master to join a USCT Artillery unit. It is entitled, “For God and Country: Reverend Henry E. Duers, Founder Star of Bethlehem Colored Baptist Church,” After the war he enrolled in a seminary school in Richmond VA and subsequently came north to minister to African Americans. In 1890, he founded the “Centennial Star of Bethlehem Baptist Church for Colored People” in Ossining. He died in 1940 and at that time he was the oldest Civil War Veteran in Westchester County. To the best of my knowledge, the following USCT units were organized in New York State. However, none appears to have originated in Westchester County. This regiment, commanded Col. William Silliman, was organized at Riker’s Island, New York, NY, on February 27, 1864. This regiment was commenced under Col. Henry C. Ward, at Hart’s Island, New York, NY on April 29, 1864. Thank you for your detailed response. As for Col. Luis F. Emilio, I am very familiar with his heroic record with the 54th Massachusetts and I reference his outstanding history of the regiment in my writing. No USCT regiments were raised in Westchester, a “copperhead” county. Regarding Col. Nelson B. Bartram, an excellent officer commanding the 20th USCT (Infantry): As you mention, well before coming to the Twentieth Regiment USCT, two weeks after the firing on Fort Sumter, in Port Chester, he had raised “Company B., of the Seventeenth Regiment New-York Volunteers (two-years’ troop) with which he went to the field as Captain.” Bartram’s troops were also known as the “Westchester Chasseurs.” (Sharf, History of Westchester County, 1: 492-496; French, History of Westchester County, 1: 146-146. On Dec. 07, 2012, at the annual conference of the Lower Hudson Council for Social Studies, at which I gave a presentation, I had the pleasure of meeting Michael S. Bennett, Past Dept. Commander, current Dept. Secretary and Archivist, Daniel Sickles Camp 3, Department of New York, SUVCW. In discussing Bartram and the 20th USCT, we wondered where he was buried. In an email of 12/12/12, Michael reported that he had followed through on researching Bartram’s burial as follows: “The New York Times article about his death on Christmas in 1886 indicated that a ceremony (funeral) was held (or was going to be held) at the Grace Church in White Plains. Other sources, such as Find-A-Grave, simply indicated that he was buried “in White Plains.” Michael visited the White Plains Rural Cemetery office and reported that “within literally seconds, I was looking at his name in the ledger book – buried two days after his death in 1886. In another 15 minutes I was standing in front of his and his wife’s headstones. What a great morning!” Indeed ! I have wondered whether the five Hills soldiers in the 20th USCT knew Bartram prior to their enlistment, or if he were familiar with the Hills community. Port Chester is well within the range of Westchester County towns where Hills men would have sought employment, and they may have been familiar with Duane Street where Bartram was drilling his men for the 17th Regiment. When the Twentieth Regiment was being raised, perhaps news had spread in the black community that this local leader was to be its commanding officer. For more information on New York’s black regiments, I suggest: Seraile, William. New York’s Black Regiments during the Civil War. New York: Routledge, 2001. I just learned that in a separate section of the Greenwood Union Cemetery in the Town of Rye in Westchester County contains several graves of Civil War soldiers of African descent. One of these belongs to Joseph Thomas, Company C, 29th Connecticut. Is he one of the soldiers you have in your book?f I feature the Civil War statue at Greenwood in my monuments series but until now was not aware of the referenced graves which are at some distance from the statue. I will get in touch with the responsible person there when I get back home and see if they have additional information on these graves.